I stopped in at JoAnn Fabrics yesterday. I managed to satisfy the fabric craving by purchasing a little Sugar Creek by Denyse Schmidt. 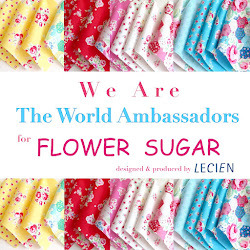 I think the top one looks like it could be from Lecien's Flower Sugar line. I noticed that some of the Etsy stores are carrying the line now. The good thing about JoAnn's is that there is always a sale going on. Quilting books were 40% off. I've been wanting this one for awhile. It does not disappoint. This book came from Amazon. I can't tell you how much I love it! The quilt on the cover is on my list of projects. You must take a look at this one. The pillows alone are to die for. Did you make any fun purchases over the weekend? I just found your blog..and I love it. Your quilts are beautiful and your fabric choices are so pretty. I really liked the red and white pre-cut fabric from Pleasant Home you showed. I am new to quilting and now have four quilts completed. I love sewing and creating the quilt tops. I take my tops to a machine quilter. I have become your newest follower and look forward to visiting you again soon. Love the fabrics. JoAnn has great selections. My mom practically skips down the aisles of that store. Aren't those fabrics wonderful! I can't wait until the berry colorway comes out. I managed to pick up the greens this past week myself. I like the vintage look they have . Those fabrics are just lovely!! What a great find. I always use the coupons at Michael's (don't have a JoAnns nearby) and I love getting the great discount! Oh thank you so much for joining in...Your picture came up it just didn't link to your page...I fixed it so your all linked up... : ) I have just started the My Blue Monday linky party...So I hope to see you again...Have a blessed week.. I love the top fabric! It does have a flower sugar feel to it! Nice selection. Oh, how I love those fabrics!!! I'm trying so hard to keep a promise to myself not to buy anymore fabric until I sew up a great deal of what I have, but this post doesn't make it any easier! My only purchases this weekend were supplies for more canning. I'm about to wrap it up soon and get back to sewing. I'll be watching to see what you do with these lovelies. We have a chain store here (in Australia) called Spotlight. It sounds similar to JoAnn's and sells the Denise Schmidt fabric (exclusively) and that same quilting book. I wonder if they have the same parent company? Renee I love the fabrics you choose and the books look fun as well. I did have a great treasure hunting weekend. Please visit me at http://donnaslavendernest.blogspot.com/ Hope we can keep in touch. Aaaahhhh, love the Sugar Creek! I was in Paducah, Kentucky. Yes! I bought a LOT of fabric and one book - Mary Lou Weidman's book Out of the Box. I read it on the flight back home! I love the fabrics, I have not had time to look closely at the new fabrics at Joann's. I did use a 50% off coupon to get a book "Inspired to Sew" by Bari J. I'm sure you'll have fun making something wonderful with your new fabrics. OOOOh love this my friend...beautiful colours. Hugs to you.